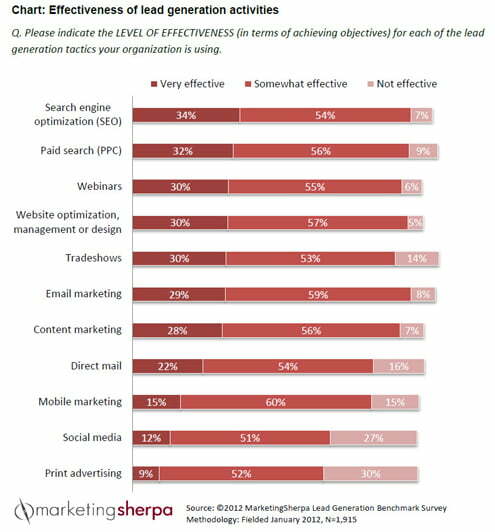 Through extensive marketplace research, we have identified the top 10 lead generation tactics for 2012, used by marketers each and every day. Below is the chart showing the breakdown of each method. We are quite happy to see SEO as the most effective method for generating quality leads. This online marketing case study was prepared by our great friends at Marketing Sherpa, who are great at compiling research about the SEM industry and have a very well respected testing facility. Hey, Lots of people saying that in the past that backlinks were previously a major factor in the way that a site’s page ranking was determined but since that google changed their algoritems it seems like that this not one of the major factores now. Is this true? or it’s just a rumer that have no base?